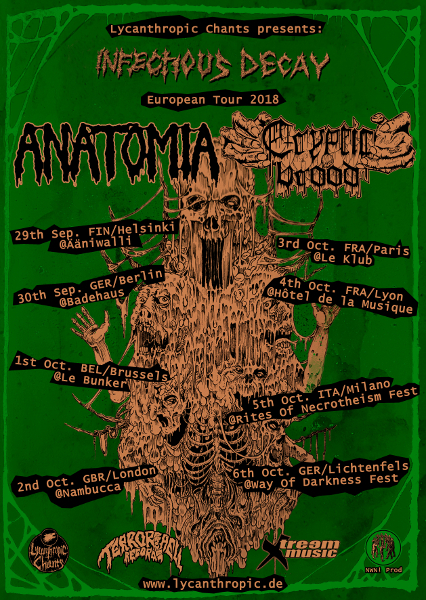 “Infectious Decay” is description enough to give this disgusting tour a proper name: Japan’s most horrifying Death Metal outfit ANATOMIA joins forces with the mold loving creeps of CRYPTIC BROOD from Germany to deliver a week full of slimy and morbid tunes. The dismal events will take place from 29th September 2018 to 6th October 2018 …beware! 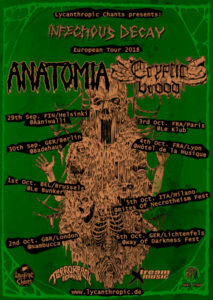 Poster art by Necromaniac Artworks.